It is with great sadness that we report the passing of Dr. Louis W. Ballard on February 9, 2007 in Santa Fe, NM. For thirty years it has been our great pleasure to share his wonderful work "The Soul" from Ritmo Indio with audiences throughout the United States and on tour abroad. 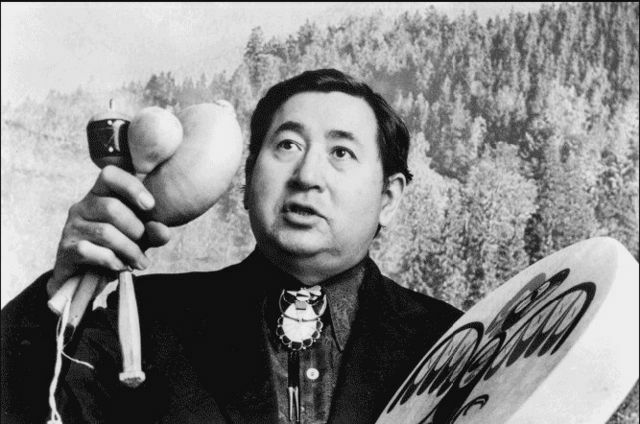 In this work Dr. Ballard combined the Lakota courtship flute (WIIKIZHO) with the five instruments of the traditional European woodwind quintet to create a very evocative piece based on an Eskimo funeral melody. Dr. Louis W. Ballard (b. 1931) composer, educator, author, artist, and journalist of Quapaw-Cherokee descent, studied music at the University of Oklahoma and the University of Tulsa, where his composition instructor was Bela Rozsa. His other teachers were Darius Milhaud, Mario Castelnuovo-Tedesco, Carlos Surinach, and Felix Labunski. He taught at the Institute of American Indian Arts in Santa Fe, NM from 1962 to1975. His many orchestral, choral, and chamber works combine Native American melodic and rhythmic material (and occasionally Native American instruments and texts) with mainstream western compositional techniques. A dedicated teacher, he collected and compiled several volumes of Native American songs for use by students.